Lee Chadwick, National Solicitors, marketing solutions. 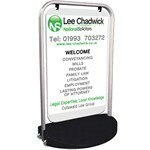 Our friends at Lee Chadwick were looking for marketing tools to enhance the opening of their forthcoming office. We scratched our heads a little and created a branded A-board. Using a slightly more vivid green than usual we've worked the messages they wanted into the design. The sign itself is both printed on both sides and hinged at the top. Movement attracts the eye hence the sign will grab more attention than a static piece of advertising. Furthermore we're working on a series of flyers which will promote the overall friendliness of the firm. 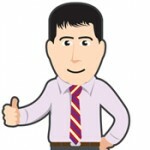 The ethos being that a friendly persona engenders trust and attract new clients.